This aquatic rodent is native to North America, and is abundant in Europe and Asia where it was introduced. They are about 2lbs as adults, and about 2 feet long from head to tail tip. The tail itself is long, slender and hairless, resulting in people mistaking them for giant rats. They get their name from their habit of marking their territory during breeding season using scent glands under their tail. This scent can be quite strong. Muskrats are generally vegetarians and prefer to eat cattails over any other marsh food. However, they also eat a variety of other plants. They also eat frogs, salamanders, crayfish, mussels and newts. In winter, the muskrat will chew off portions of the plant that is submerged under the ice. While on land, the muskrat is preyed upon by foxes, coyotes, raptors, mink, among others. When swimming it is hunted by snapping turtles and northern pike. They are also trapped for their fur by humans. The muskrat can have several litters of 5-10 young a year, when food is plentiful. Males will compete fiercely (sometimes resulting in injury or death) over females in the spring through the summer, and each will mate with many females. Their average life span is only two to three years. Come autumn, the young adults are forced to seek out watery homes of their own. This is usually when they are found in town by bewildered humans. There is a muskrat den in the bank of my farm pond. A. If there is a muskrat den in your farm pond, there must be a food supply there for them to decide that yours is a very nice place to make a home. If you remove the food supply, the muskrats will be forced to find a new home that offers a food source. 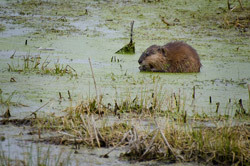 Since muskrats eat a wide variety of marsh plants, it may be necessary to remove all of your pond’s plant life. If you can find it in the garden centers, applying coyote urine around the perimeter of your pond should encourage the muskrat to abandon the area, thinking that there are predators present. However, if you can find a way to cohabitate with these little critters as neighbors, you will be rewarded with many hours of amusement. Muskrats keep eating from my garden. A. Garlic is an effective deterrent against wild animals in the garden. Many gardeners plant it liberally in their gardens for this very reason. You can also try sprinkling cayenne pepper around the perimeter. If the muskrat is very determined, you may have to resort to an electrified wire fence strung up around your garden. Try to mount it 2-3 inches off the ground so that it would be at the face level of the muskrat. Since muskrats are nocturnal, you can turn the electricity off in the morning and turn it back on at dusk. There are also commercial repellents to spray directly on your plants as a deterrent. Muskrats are frequenting my pond and eating my pond plants. A. If the muskrat is targeting specific species of your pond plants, try trading them in for a different non-native species that may be less palatable. Without a yummy food source, the muskrat will be forced to find food elsewhere. A little known fact about the muskrat is that its incisor teeth actually protrude ahead of the lips, so that the muskrat can chew on reeds and roots under water with its mouth closed. There is a muskrat in my yard! A. In spring and fall, and at times of crisis (like a flood or drought), muskrats are known to make lengthy excursions across land and far from water to find a new home. This may involve them coming through urban areas, where they are mistaken for giant rats or thought to be rabid due to their “unusual” behavior of being far away from a water body. When this happens, it is probably best to let them find their way on their own, because they can and will defend themselves if they feel threatened. If, after a couple hours, the muskrat seems like it still cannot find it’s way out of your yard, you can try to lure it out with a trail of fresh vegetables, apples, and even peanut butter, and observe from afar. Do not try to catch it as they can and will bite.